Stock market debutante LinkedIn was the belle of the ball on Thursday. LinkedIn kicked off its first day as a publicly traded company and made a big splash — so much so that the markets rallied and stirred in ways that harked back to the tech boom of the 90s. Those days are hardly back but LinkedIn’s early and promising success is giving investors something to feel good about, and they’re also thinking of LinkedIn’s social networking peers about to take their own plunge into the market waters. The IPOs of Facebook, Twitter, Groupon, and Zynga are all expected to arrive very soon — perhaps more than a couple of those will get here before Christmas. 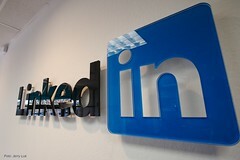 Thursday, closing time at the New York Stock Exchange saw LinkedIn’s shares being valued at $94.25. Their offering price was $45 and the day’s high was $122.70. It was an excellent first day that saw the stock market entrance of the first big-name, American social media company. $9 billion is the figure that most currently represents the company’s valuation. Although subdued controversy about initial under-pricing of shares has ensued, here is a choice statement from Jeff Weiner, LinkedIn’s chief executive: “We were able to find investors who understood our story and understood our desire to invest in our platform.” Correct, sir!